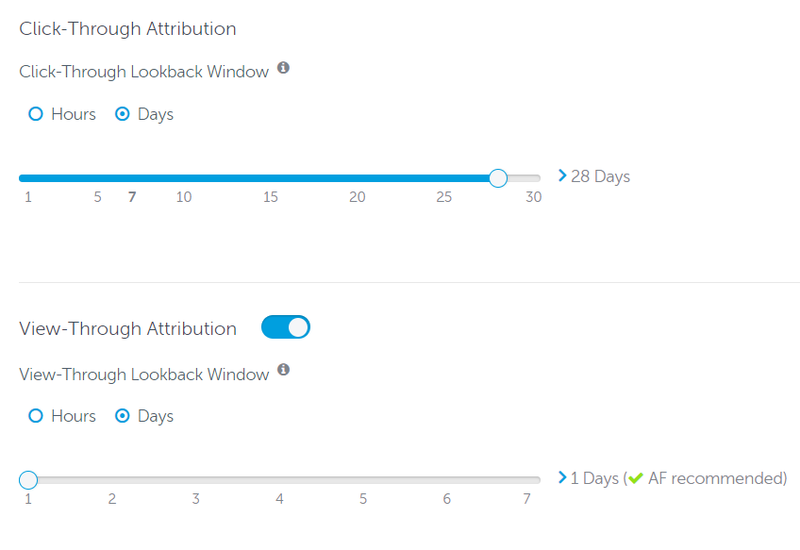 AppsFlyer's configurable attribution lookback window allows you to customize the attribution period based on your agreement with media sources. By configuring different attribution lookback windows for different media sources, AppsFlyer ensures that attribution is carried out according to the agreed-upon terms. In order to ensure fingerprint uniqueness and maintain a high level of accuracy, the lookback window for fingerprinting is much shorter than the referrer and ID matching lookback windows. The click fingerprinting attribution lookback window is limited to a maximum of 24 hours on iOS. Android apps on Google Play have up to one hour, and out-of-store android apps have up to 24 hours. To learn more, read about AppsFlyer's fingerprinting method. Each SRN has its own default lookback. 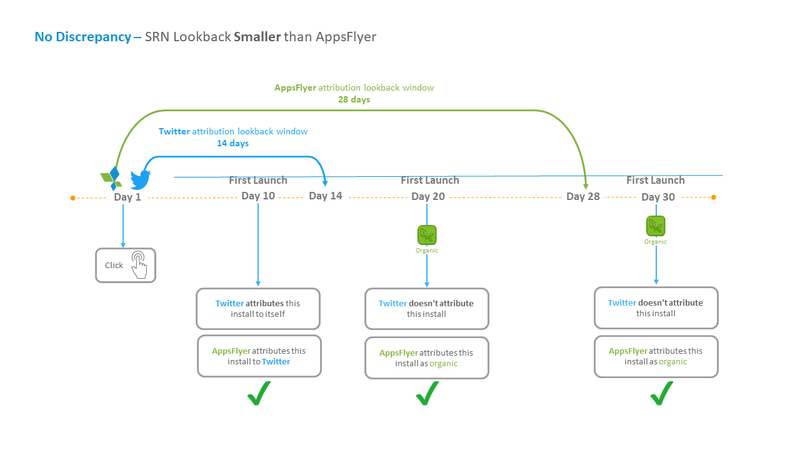 We recommend matching the lookback window value in AppsFlyer with the SRN's value to minimize discrepancies. Changing it might result in discrepancies. To learn more, see an SRN discrepancy example. The selected time is automatically reflected in the tracking link. Select the parameters that correspond to the campaign i.e. campaign name, ad set etc. Click here to learn when you should use hours for attribution windows. You can set the lookback window in OneLink as well. Below is a graph that shows the distribution of first app launches from the day of engagement. The graph can give you a better sense of the number of users who install the app as a function of the lookback window. The majority of users, a little over 97%, who launch the app do so within 7 days of engaging with the ad. The remaining 2% do so in the span between day 7 and the end of the lookback window (day 30). In fact, almost 62% of users who launch the app, do so within 15 minutes of engaging the app. Within one hour, 72% of users do so within the first hour. Below is a list of possible scenarios and examples of lookback window usage. 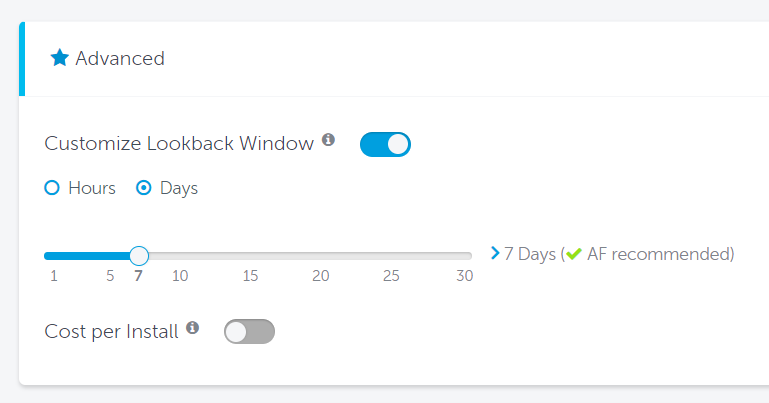 You set a campaign on Twitter and configure the click-through lookback window to 7 days. Twitter, on the other hand, has a default lookback window of 14 days. You set a campaign on Twitter and configure the click-through lookback window to 28 days. Twitter, on the other hand, has a default lookback window of 14 days. It is possible to have a tracking link that doesn't have a lookback window parameter. 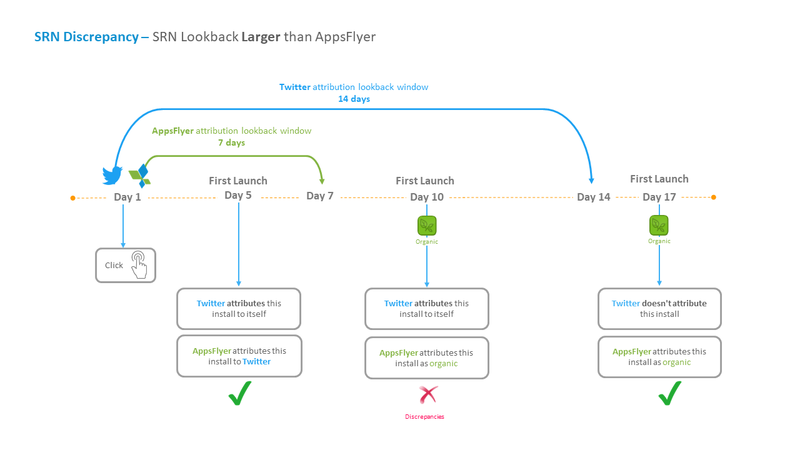 In such cases, AppsFlyer defaults to a 7-day lookback window. We recommend to always set a lookback window on tracking links. Flash campaigns are campaigns whose intention is to prompt users to install the app as quickly as possible and within a short promotion window. An eCommerce app called SuperShopping runs a flash campaign. In this campaign, a user who installs the app within an hour gets special offers. Johnny, SuperShopping's lead marketer, creates a tracking link and sets the lookback window to 1 hour. This way Johnny knows how many users respond to the campaign. In addition, the app's developer can identify the users that come from this flash campaign and deliver the promotions that the campaign advertises.